Provide comfort for the family of Jack Newman with a meaningful gesture of sympathy. Jack Newman Jr., son of Jack & Elma (Downing) Newman, was born in Seattle, WA on August 29, 1929. 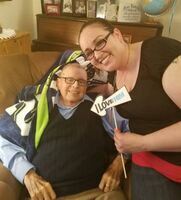 He passed away on March 30, 2019 at his home in Oak Harbor, WA. Jack spent the majority of his formative years in the greater Northwest Washington area, having attended numerous schools. His father was in the logging and bridge construction business. Jack moved to California in 1946 and graduated from Sonoma High School after which he was employed as a teller for the Bank of America. Jack joined the U.S. Navy in September 1948. In August 1949, while attending the Navy Personnelman “A” School, he met a classmate, his future wife, Leona “Lee” Ross. They were married in Norfolk, VA on February 4, 1950. Jack was a “tin can” sailor having served on destroyers in the Atlantic. Upon completion of PN School he was assigned to the Personnel Accounting Machine Installation, Naval Station, Norfolk, VA. Then on to the Pacific in 1952 and served as a Liaison with the Republic of Korea Navy Headquarters in Pusan, Korea; the 1503rd Air Transport Wing of the U.S. Air Force at Tokyo, Japan and Headquarters Support Activity, Yokosuka, Japan. He served with the Fleet Airborne Electronics Training Unit Pacific, NAS San Diego; Personnel Accounting Machine Installation, NAS San Diego; VAW-13, NAS Alameda; VP-46, NAS Moffet Field. The family arrived at Whidbey Island in July 1966 for his last career assignment which was with COMFAIRWHIDBEY, NAS Whidbey, and after 22 years active duty, retired as a Chief Personnelman on July 1, 1970. Jack’s priorities in life were family, church and the Knights of Columbus. 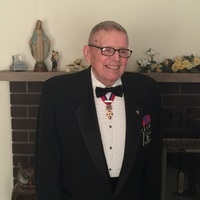 He joined the Knights in Oak Harbor in October 1967 and served in all offices including District Deputy and the Fourth Degree Master of Western Washington. He was a member of St. Augustine’s Catholic Church in Oak Harbor. Jack is survived by his wife Lee of 69 years, 7 children…Mick, Stephen, Pat, Gwen (Bill), Kathy, Monica (Harith) and Mary, as well as 12 grandchildren, 13 great-grandchildren, numerous nieces, nephews, and cousins. Jack was preceded in death by his parents and 3 children, Jack III, Mark and Gregory. Viewing/Rosary Service will be on Thursday, April 11, 2019 from 1-5 pm at Wallin Funeral Home, 1811 NE 16th Ave, Oak Harbor. A recitation of the Rosary will start promptly at 5:00pm. 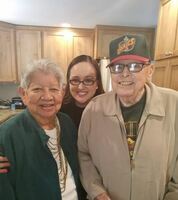 Funeral Mass for Jack will be celebrated on Friday, April 12, 2019 at 11:00 am at St. Augustine’s Catholic Church, Oak Harbor, WA. A reception will follow in the parish hall. Interment will be Wednesday, April 17th at 12:30 pm at Tahoma National Cemetery in Kent, WA. Donations can be made in memory of Jack to the Knights of Columbus, John E. O’Brien Council #3361, PO Box 795, Oak Harbor, WA 98277. To send flowers in memory of Jack Newman Jr., please visit our Heartfelt Sympathies Store. Recitation of the Rosary will be held at 5 pm. Family and friends are invited to attend the reception held in the Parish Hall immediately after the funeral mass. Donations are being accepted for: KNIGHTS OF COLUMBUS (3361 JOHN E OBRIEN).